Just click on the picture to see the 120 avilable races. WARANGEL is a fantasy universe created and illustrated by Angelo Porazzi. The game includes now 120 different warrior races, with rulebook and reference sheets all translated and available in English, and all the map of each race inspired to real sectors on Earth. 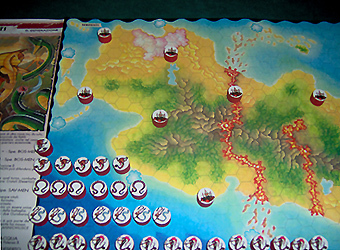 It is a light wargame with a simple and well illustrated rulebook, good for younger players too. The first edition was published in 1996, released as collectible issues and distributed in Italy. 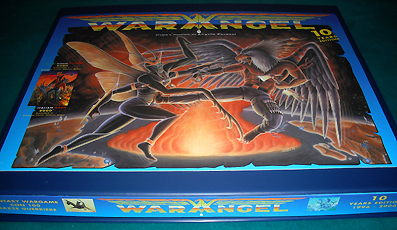 On 2001 the Warangel Card Game was distributed in Italy by Hasbro. Since 2007, Warangel is available with the incredibly successfull service Create YOUR Warangel. Is just one of the endless combinations of battles you can create. Choose and receive your favourite RACES already mounted on painted woodenblocks, as you see in the pictures. Choose and receive your favourte hexed MAPS representing real sectors of Earth. Choose and receive the REFERENCE SHEETS of Races you are most interested. Here you see many SAMPLES of Races mounted on painted woodenblocks, to help you in choosing your favourite armies. MAPS - Full Colour, A3 format, each one illustrating a real sector of Earth: 4 euro per Map protected in its transparent A3 plastic shield. REFERENCE SHEETS - Printed in English, A4 format, full colour, 1 per each race, describing history and warriors characteristics: 1 euro per Sheet you choose. 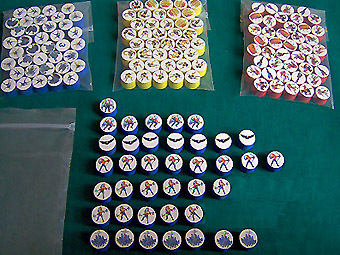 DESTINY SHIELDS - They substitute dice and tables, set of 10 pieces: 1 Euro. Here some SAMPLES of how you can order with the service Create YOUR Warangel. COLLECTOR SET for 2 Players or more: 2 RACES already mounted on painted woodenblocks you choose (example Chelates and Templars) 30 euro, 2 hexed MAPS (in this case Iraq, and Alps) each one protected in its transparent A3 plastic shield 8 euro, 2 REFERENCE SHEETS 2 euro, 1 set of 10 Destiny Shields 1 euro, RULEBOOK 15 euro, Warangel BOX to contain all the wooden races 5 euro, 1 MAP COLLECTOR to contain all the Maps and the Box itself 20 euro. Total 81 euro. The Collector Set is great if you wish to start your collection of Maps and Races, with the Box and the strong Map Collector to protect every element in the best way, or if you wish to make a complete great gift. Of course, you can order the Collector Set with 2 or more races of your choice. For any info and order, feel free to contact, you are welcome anporaz@libero.it. Each players chooses a race: take the REFERENCE SHEET and the COUNTERS of your favourite race. Each player chooses 1 MAP, or takes the specific map of choosed race. 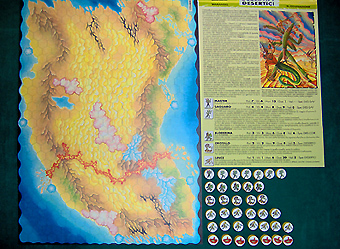 In the picture see the three elements each player must have: 1 hexed MAP (here you see Mexico), the REFERENCE SHEET and the COUNTERS of your race. 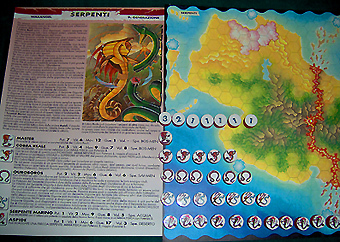 Each player reads clearly to other players the Reference Sheet of his own Race. Each Race starts with 7 FORTRESSES where are hidden own Resource Points. The RESOURCE POINTS are the key to Victory: in the reality they could be weapons, food, supplies. All Races start sith 10 Resource Points, secretly hidden in own 7 fortresses. Each Race starts with a Fortress hiding 3 Value Points, one with 2 and five with 1, as you see in the picture. VICTORY: Control at the beginning of your turn, 12 Resource Points at least. 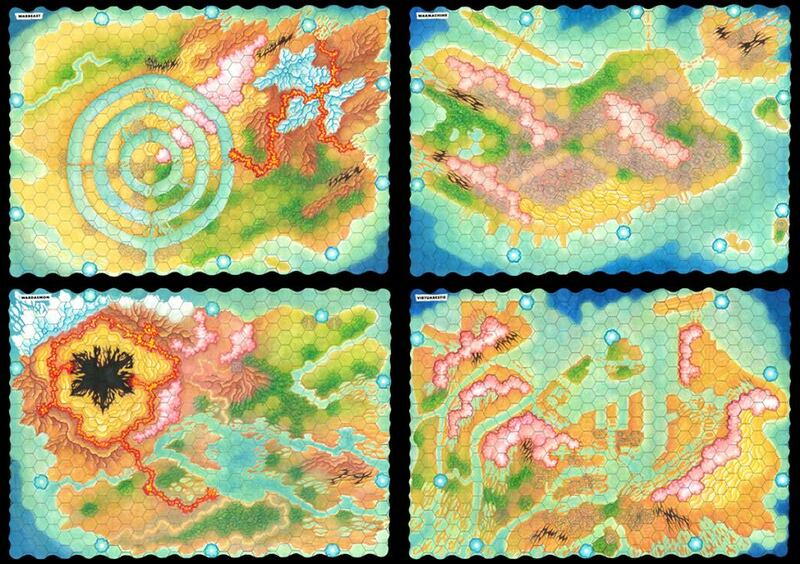 This means place own warriors in a number of Fortresses (own and enemies) so that the total of Resource Points hidden in these Fortresses is 12 at least. Place a screen or Warangel Box among Maps, to not see enemy placement. 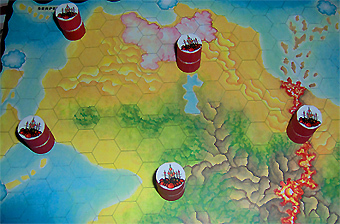 Secretly place your FORTESSES at 6 hexes of distance at least . When adjacent they are at distance 1 so leave free at least 5 hexes as you see in picture. Each Fortress hides 1 to 3 RESOURCE POINTS. The wooden counter has the Resource Point number on the other side of the Fortress icon. You can also hide a warrior under each Fortess, just like you see in the picture. Pow. Power: strenght and skillness in close combat. Vit. Vitality: number of wounds necessary to defeat the warrior. Mov. Movement: The Movement Points the warrior may spend to move on different hexes of maps. Each hex has an own cost reported on the rulebook. Wrs. Warriors: number of warriors of that caste you must place at the beginning of each battle. Here the complete WARANGEL RACES' LIST with the number of Warriors for each Race and the matching hexed Maps illlustrating real sector on Earth. Val. Value: The cost of the warrior and his resistance to particular Mental Weapons. Spe. Specializations: hexes on maps where the warrior always spends only 1 Movement Points and may RE-FLIP his Destiny Shields, both on offence and on defence. DESTINY SHIELDS Are the "coins" that substitute dice and tables, designed to have a fast gameplay and a good control on luck factor. On one side they have a "drop" icon, on other side they are white. The "drop" usually represents a wound on enemy: the more Shields you flip, the more are possibilities to hit a target. A warrior with Power 5, flips 5 destiny Shields; a Physical Weapon with Power 3, flips 3 Shields and so on. So, to defeat a target with Vitality 4, a good attack is at least with Power 8: with less you are hoping in fortune. Secretly place your WARRIORS on your map, considering that only passages to invade other maps are the BLUE HOLES, near the border map. Each one of these Dimensional Doors has their own match on all maps (just imagine to overlay maps to found the matching gates). No warrior may be placed on a Blue Hole. 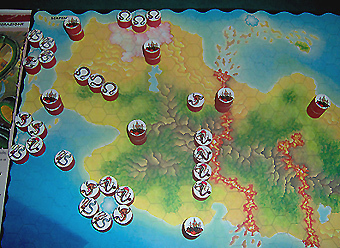 First player who declare his placement is ready, has the right to move first. When al players declare their placements are ready, remove the screens among maps and begin the battle. Each Race combats in its own very particular way: each single warrior has its own characteristics, actions, weapons, and terrain specializations. So every single battle will be new and different from the other, always a new game experience. 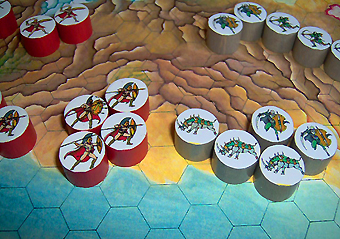 Here you can find a BATTLE EXAMPLE with two mighty races: Immortals and Redskins. The Map Collector showing last Map of 1st Generation (USA west with Grand Canyon and California separated by San .Andreas chasm, perfect land for Eagles) and 1st Map of 2nd Generation (Iraq, with Tigris and Euphrates rivers and a large sector of desert, specialzation terrain for Chelates' Army). 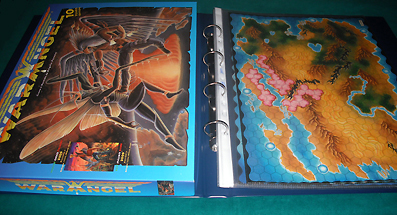 For gamers who like to collect the great number of Races and Maps available in Warangel universo, is available this Map Collector with Logo and illustrations of the game, on Cover and Back. 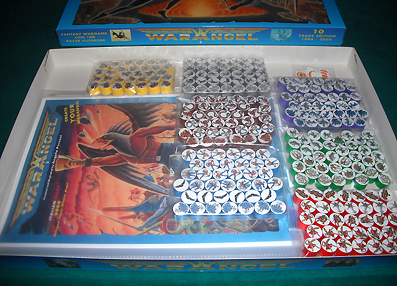 It is really useful to collect A3 format plastic shields that perfectly contains and protect the Warangel hexed Maps. You can open the metal rings and take the Maps you will choose for each battle. During your battles, use your Maps inside their plastic shields, this will protect them perfectly. WARANGEL MAP COLLECTOR: 15 euro. 2) The Box, containing the Rulebook and the Races, fits perfectly inside the Map Collector which keeps in order every choosed Map thanks to the metal ring and perfectly protects the Box with a cover that is much more resistant of the Box itself. 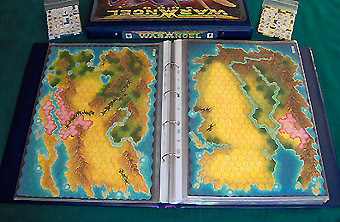 3) The Map Collector, folded, perfectly holds the Box and every element of the game choosed by the player: the Reference Sheets, the Races, the Maps you can choose to "Create YOUR Warangel". 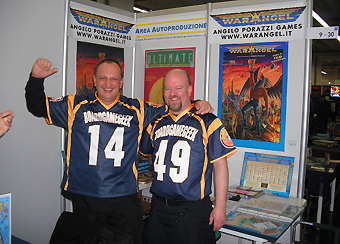 With Warangelo and Derk at BoardGameGeek Booth, Essen 2010. Book cover is the illustration of Valkirie on Dragon of 1986, the very first drawing I realized about Warangel Universo. 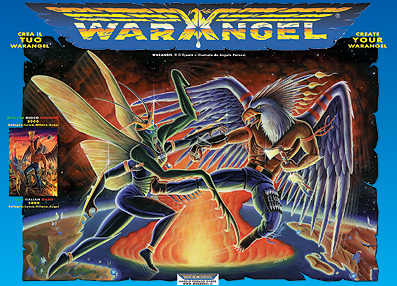 In 1996 the first edition of Warangel was published as collectible issues. 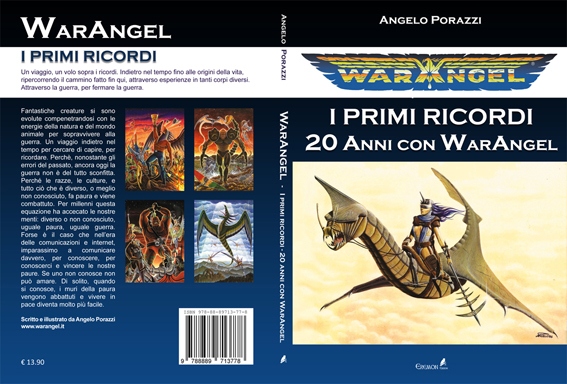 30 years ago first illustration, 20 years ago first edition: on 2017, to celebrate first 20 years of Warangel, this book is published. "I Primi Ricordi" means "First Recalls". To take the reader through a journey in his remembers of past lives, in the bodies of different creatures and animals and in the creation of planet itself. Remember means knoweledge, knoweldge may bring to love what you know. If you know the various forms of life around you, probably you'll love them. 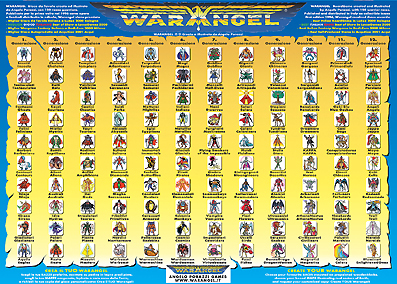 With your Recalls, your Knoweledge and your Love, maybe you'll be ready to accept the duty of a Wararngel, the Angels of War that now may re-born on Earth to defeat the only real enemy: war itself.